Sometimes when I'm designing, I have a pretty good idea of what the end result should be. 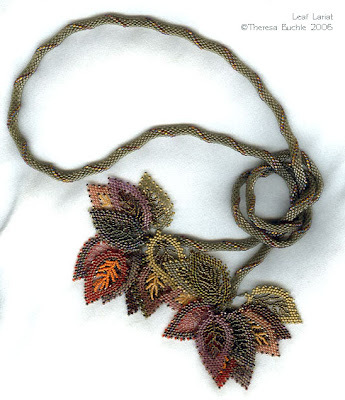 I carefully choose the seed beads and the embellishment beads in certain colors. I find just the right thread for the stitch. Then I start stitching and taking notes as I stitch. I don't usually work from a sketch, just a picture in my head. For the current project, I had an image of rosy pinks and golds. I had found beautiful Swarovski pearls, crystals and a drop in just the right shades. 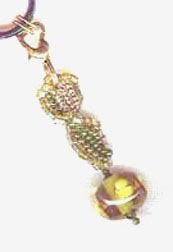 Then I found the perfect seed beads in a silver-lined pink AB, with just the tiniest flash of blue, echoed in the Swarovski pendant and some of the embellishment beads. I started stitching. Did you know that beads can be sentient beings?? Cheese and rice kids, you would have thought I had never done this before! So I unbead and start again. Take out the 8° beads. And again. I need more color, so let's add those. Nope, that REALLY doesn't work! Start again. These seed beads are not working so I'll try those over there. And again. I'll go find a Delica in the right shade of pink. And again. Last night, after the SIXTH false start, I got it to look basically the way I picture it in my feeble brain. And when I say false start, I don't mean just the first three rows. Oh no, it is not that simple. I bead a good two to three inches before I can tell whether things work or not. It's a very good thing that beading thread is inexpensive. 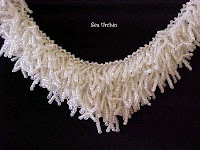 Did I mention that this was just the neck piece portion?? OOOOOOOO, I can't wait to start the pendant (she said sarcastically). I'm sorry, what did you ask? Why do I do this if it is so frustrating? It's very simple, my dear. The end result will be splendorous and so mesmerizing, that people will be struck speechless when they gaze upon it (at least I hope they will). Besides, I cannot NOT do it -- (whispering) it's part of my essence. I got my Fly Pen. I've gone through the tutorial and now it's charging its little battery. We have decided that if it does not work well for me, it will go to Ariel to help her with school this year. It is, however, very cool. I'll let you know how it works for my notes on how to make a beaded piece of whatever. And now, since I've got that all figured out, I can start working on the new projects. Yes, yes, it's true -- I used the Fly Pen as an excuse for procrastination. It's been a very long time since I had a summer vacation. I have definitely been bored out of my gourd at times, but I've also had a lot of fun. I've spent lots of time with my girls and with my husband just playing. Playing is a very good thing and we should never give it up. We have played with the Playstation. We have played in the pool. We have played with the chickens and the kittens. We have giggled and laughed and hugged. Playing is a good thing, beadlings! Now fly! FLY! Hee, hee, hee, hee, hee! All four pounds of Tatiana, the Ameracauna hen, climbed up my arm while I was holding her (she likes to be petted) to sit on my shoulder yesterday evening. T-man rushed into the house to find a camera with a charged battery because he thought it would be a great picture for the blog. Do you have any idea how bad your hair looks after a chicken combs it? I'm so glad the battery was not charged! Remember Matilda, the spider with the web on the side of the pool? Two of her daughters have made little webs near that spot and are growing daily. I'm hunting rosy pink beads today! What fun!! And yes, I'll charge the camera battery today. We were cleaning the pool Sunday evening. Don't get excited or envious. We have an above ground pool just big enough for the four of us to float in. Anyway, T-man and I had drained it and were scrubbing it down. The sun had not quite set and there were storms on every horizon, but no rain on the prairie - just a lot of humidity. Suddenly, the sky was filled with dragonflies! I have never seen anything like this. It was like they all hatched simultaneously. They were swarming in everyone's yard. You could actually see them up at the other end of the road and way up in the sky. A couple of barn swallows took advantage of the situation (sorry, Cat). Alfred Hitchcock would have used this scenario to his advantage! Maybe I should give Clive Barker a call. Needless to say, the camera battery was not charged. I'm not sure I could have gotten a good shot anyway, but I definitely would have tried! 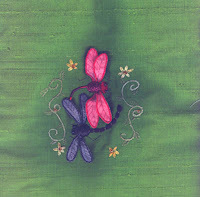 By the way, I love stumpwork and finished these dragonflies that my dear friend Joyce had started. Cat now owns them. I went shopping for beads yesterday so I can get started on my samples for my next proposals and work up some local class offerings. I came home with a big bag of Swarovski goodies from Laurie at Mica in San Antonio (nope, sorry, no web site for her yet). Ariel and I spent the entire day together. She has her own bag of goodies. We had lunch, then drove back to Austin to visit our favorite bead store and see more friends. Again, she scored on her own with goodies. Then we went to get her a MOOD RING. Yes, my child is repeating history. I remember my own mood ring. She put it on her sock monkey last night and proudly proclaimed "Mom! Monkey has moods!" So, as a small teaser of things to come, I will let you know what I have in mind as far as the beads are concerned. I'm doing a project in crystal and with sprinkles of gold, one in rose and gold, one in bronze and silver, one in silver and gold, one in turquoise and violet, and maybe one in blue. I have a new set of patterns to be done in black with jewel tones. I hope you all noticed that green and purple (okay, violet might count) were not in there. T-man wanted to take my vital signs when I gave him this information last night. Hey, it does no one any good for me to become predictable, now does it? Is It Truly Friday Again? I would like some verification on that. It seems like just yesterday I was in San Antonio! My goodness, this week has just flown by while I have been a slug. No more, I must just back into my groove. I have a HUGE list of things to get done and being in SA talking to EGA members added about 10 things to the list. My fingers are actually twitching to get back into the beads, which is a very good sign! I also have a ton of cyber work to do, starting with the Etsy store and the web site (notice that I did link to those because they are pitiful right now). And so the time has come to embrace Blogging Without Obligation, because sometimes less IS more. I'm not deserting you, I just don't want to spread myself to thin as that would become incredibly boring to you when I start struggling for something to ramble on about every day. "I would much rather give you wonderful tidbits of insight occasionally", she said with sincerity. I did mention that I'm a frustrated novelist, didn't I? I will "chat" with you more next week. Have a great weekend! Oh my, beadlings, it is sunny and it is HOT already! Monday, when Natalie and I were running around South Austin, it got up to 103. I'm pretty sure it was just as hot yesterday, but apparently we have had a COLD front move in and it's only supposed to hit 98 today! Oh, it is to laugh! I have spent two days being a slug and I'm not sure how much more of that I can do. I'll give it another try today, but I'm not promising anything after today is finished. It's hard work being lazy! So, until I finish my "vacation", I really have no new stuff! That being said, stay cool and dry wherever you are and keep on beading! Well, I'm back and I am utterly exhausted. T-man has convinced me to take a few days off, doing nothing more taxing than taking care of the chickens and the cats. Okay, I can do that. I had such a marvelous time at seminar! I had fun, I met some new friends, ran into some old friends, and even had a trip down memory lane. There are not enough words to describe what a good time I had. The only downside to trips like this is eating restaurant food every day, morning, noon and night. Unfortunately, most pre-made foods come with MSG and it does not take much to do me in. This year, it settled in my knees and I would ache every night. But, it will all be better by the end of this week -- lots of salads and water to flush the MSG out of my system. I had five new beaders in my larger class. They are now converts to the seed bead side (insert Darth Vader noises here). My mission to cover the world in size 15° beads moves forward! Many, many thanks to the San Antonio Needlework Guild for the hospitality and to the South Central Region Seminar board for a fantastic seminar, and to Clara who gave up her day to come sit with me behind a table and talk beads to anyone who happened to stop by. I'm off for today so I can keep my promise to my hubby, but I'll be back tomorrow with bead musings, as always. And as my tiny friend Luke says "Later, Dudes!" I'm Off To Teach Some Beading! Here I go. I won't have much time to blog while I am away, but Monday's post will be, well it will be written by me! HAH! Okay, I didn't get enough sleep last night, but today has been easy going. So, Natalie and I are on our way. Have a great weekend, and if you are attending the EGA South Central Region Seminar, I'll see you tomorrow! Either way, happy beading!!! I used to live in Houston, Texas. One of things I disliked so very much was the humidity. 80% relative humidity was a good day. Today, here on the Central Texas Flatland Prairie at the foot of the Hill Country, Houston seems like paradise. Yuck. I hate that feeling. You get out of the shower, and you need another one as soon as you walk outside. But enough of my grousing, on to better things. I went by Pam's Friday afternoon and picked up a box of goodies for the lucky shoppers at the Fiesta Marketplace portion of Seminar. My, oh my, I want half of the box for myself. I'm bringing lampworked thimbles, blue bonnet beads (yes, by popular demand they are back!) and the most gorgeous matched pairs that would make perfect earrings. There is one pair in Pam's favorite pink that are just to die for! Oh, I cannot wait to put these out and offer them up to the stitchers! And kits are almost done. It has been a very long time since I have had to put together so many kits in one session. 32 of them were for the classes, and the color mixtures are breathtaking, if I may say so. For inspiration, I pulled out pictures we took in 2005 when we spent Thanksgiving in Lost Maples State Natural Area. The fall colors were late, and we got some gorgeous shots. The picture of the girls on the top right was taken there. So, I've got just a few more things to put together and price, then pack. That's it. And it has all been fairly stress free. HAH! Yeah, right. More on that when I get back! Muse on that for a while. And remember, don't think --- just do! Evidently, according to the CALENDAR it is Friday. I've made great strides in what I have left to do. I must run to Pam's house tonight to pick up more goodies! She has a small fan club among the EGA. It poured this morning, which means if you walk in certain spots of our yard you will become an inch taller. Well, when Ariel went to feed the chickens, Tatiana got out and went to the places of nothing but clay mud. Yuck. But she is now back in the pen, happily scratching and eating. There is enough dry grass in there that they aren't getting too muddy. And now the sun is coming out in full force, so today will be reminiscent of my life in Houston, but that's a story for another time. What are you doing this weekend? I ask so that I may enjoy it vicariously. I'll be slaving away in front of the scale, with my little baggies. Okay, one short story. Let's go back to 1997, when I first started selling beads. We lived in a single-wide trailer in South Austin. It was not the Taj-Mahal, but it was paid for. Okay, picture this. I had a large living room window, and when the blinds were open you could see clearly into the living room. Slightly off to the side, but still within view of the window, I had a drafting table where I could stand and do the weighing, tubing and bagging. I have a small digital gram scale. So there I am, weighing, tubing, bagging, and I notice that a patrol car keeps doing the circle drive in front of our house slowly. I figured they had a call about the neighbors, because that was a frequent occurrence. Then it hits me why the police keep driving by my living room window . . .
And on that note, have a groovy weekend, whatever you do. Yes, it's another quickie and yes, I am on the correct page of the calendar! Nope, I haven't lost it. It's kit-making time! It certainly is! Big, hot gusts of wind are coming straight out of the south. It's also a bright, sunny day out there. Since I've managed to have another week, I finished the cows (pictures tomorrow) and can get some more instructions out of the way. I'm actually very glad to have had this extra time. I had lunch today with my darling daughters. It was nothing special, but it was nice just the same. And now I am overstuffed. 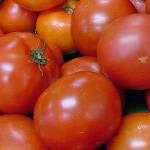 There is a big tomato scare in our part of Texas. It seems some have been contaminated with Salmonella. Crikey, kids! Ariel and I had tomatoes on our sandwiches! Apparently the safest tomatoes are the ones you grow yourself. I'm sure glad ours have started coming in! I guess we will cross our fingers and hope for the best over the next 72 hours! And of course I did not find out about this until after lunch, when I got home and talked to T-man who had left two messages. Did I have the cell phone with me? Well, no, I did not. I was incommunicado! tornado - Being overwhelmed by work or circumstances. You are stressed out. If you are overtaken: Things are out of control in your life. If you escape from or avoid it: You are stressed but can handle the situation. Fortunately, I've never been overtaken by the tornadoes. Hmmmm. I know I've been trying to convince myself and everyone else that I'm not stressing, but there sure are some obvious signs that I am. I wonder if I can get a massage during seminar??? So, in honor of the tornadoes, I'm showing you the Twister Scissors Fob: I have quite a few people ask what scissors fobs are for. Well, if you are in a big class, like those at EGA seminars or the Bead & Button Show, a personalized scissors fob makes your pair easy to spot. Plus, they're just fun and nifty. Hasta la bye-bye, beadlings, I've got typing . . . well, other typing . . . to do! And don't take in any suspicious looking tomatoes! Remember how I told you I have No Concept Of What Time It Is? Well, I have once again proven this to be true. I had it etched in stone on my little mental calendar that seminar starts tomorrow. I believed this so much that I had set aside a special project because I didn't think I had time to finish it and get all the kits finished to. I had arranged for Ariel to stay at grandma's house and had even arranged for Natalie to drive me to SA. Seminar begins June 10th. And after that, what's left to say?? I've been given one more week! Yippee!